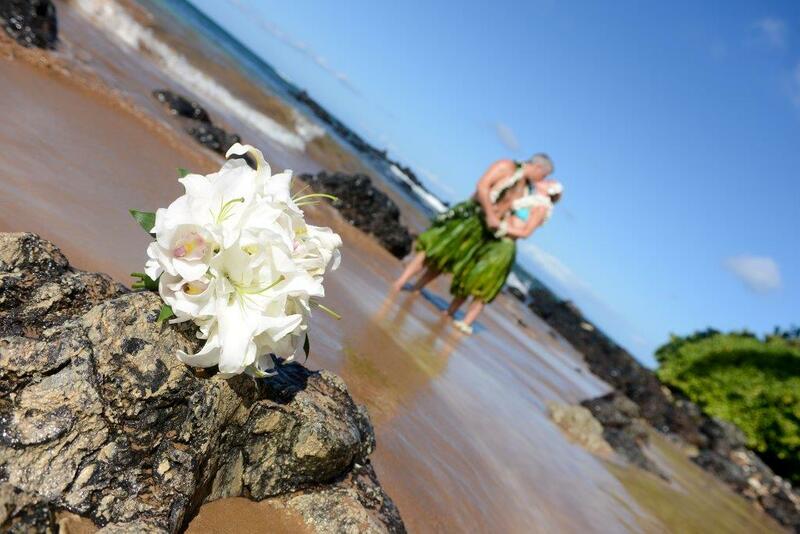 Peggy and Enrico celebrating with their two best friends on Paipu Beach with music, conch shell, love and laughter. What a fun wedding tonight with Armin and Regina. We were able to capture them while they were oblivious to their surroundings and got some great shots with all the natural light. Photo credit Francois Laborde Photography. 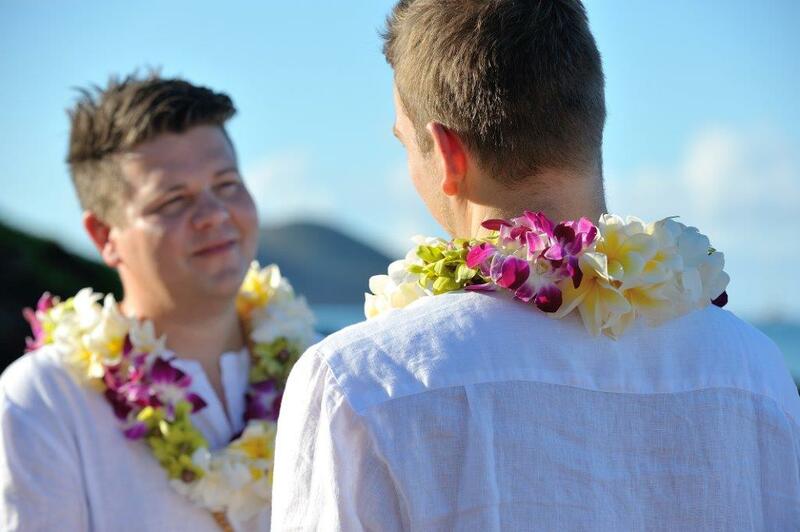 Daniel and Andreas decided on a very short notice that they would love to take the opportunity, while being in Hawaii, to legally tie the knot. Actually: Andreas had no idea what Daniel had in mind!! 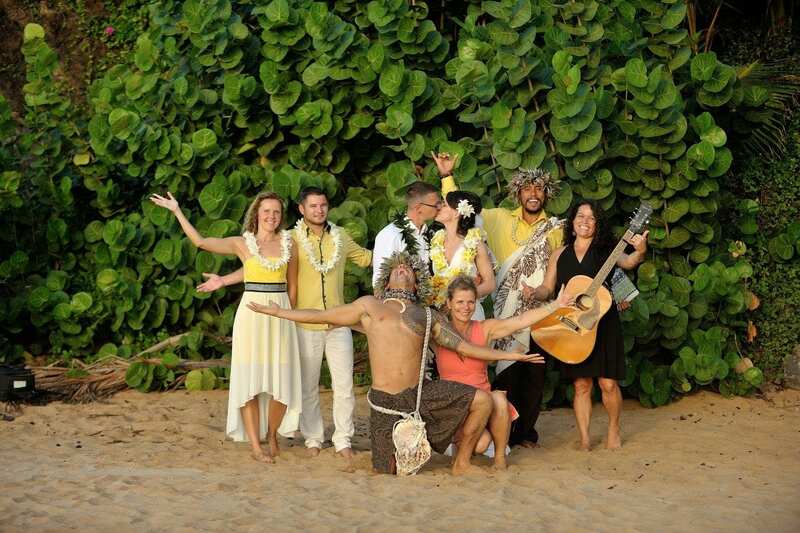 They had traveled to Oahu and Kauai and watched a few weddings on those beaches. 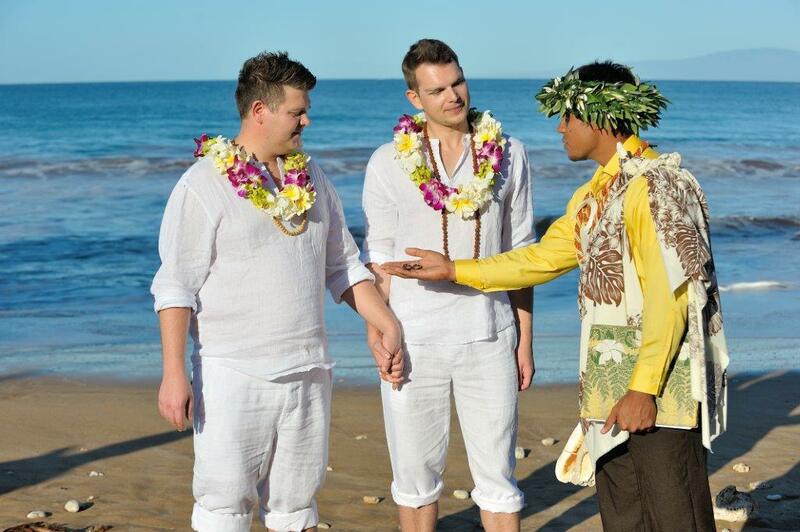 Daniel, ever being the romantic, decided to surprise his long time love with a traditional Hawaiian style ceremony. With all those beautiful beaches on Maui, they selected remote Paipu Beach and were lucky enough to be all alone. Let’s fly away! 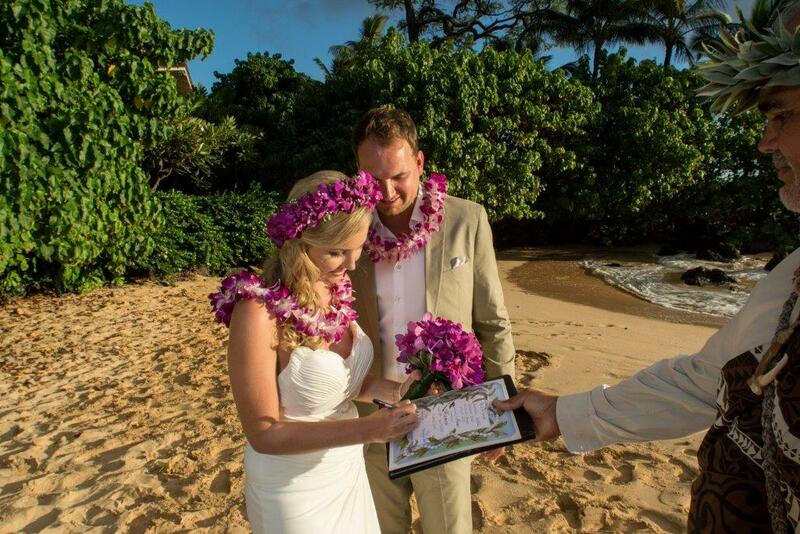 Katharina and Ralph and their five year old daughter Maya attended the iron man on the big island and decided on the spot that Hawaii was the perfect place for a destination wedding. 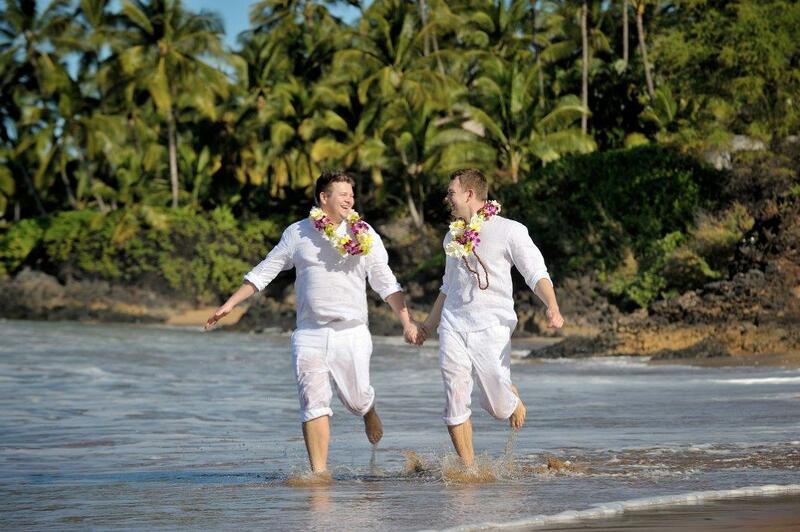 They had suffered a tragic loss just one year ago and therefor had not wanted to celebrate a big wedding back home. 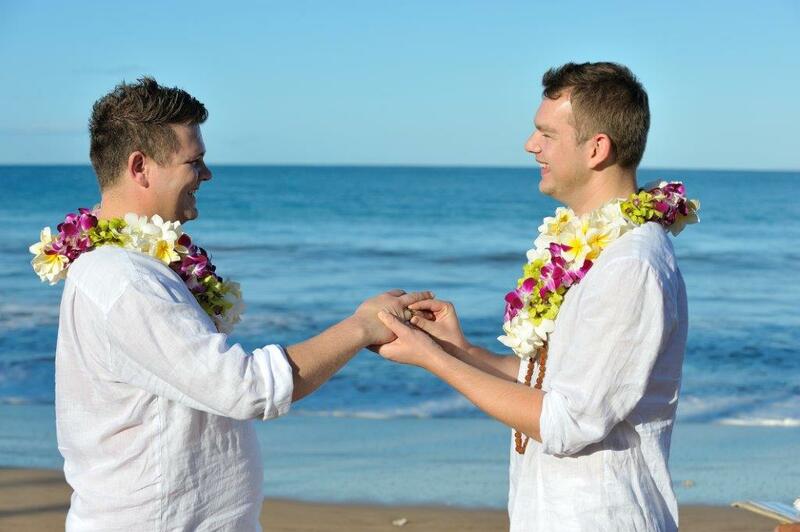 Instead they opted for a romantic sunset wedding on one of the remote Makena beaches. They gave us two days to prepare! Called on Monday and got married on Wednesday! Talk about short notice weddings! 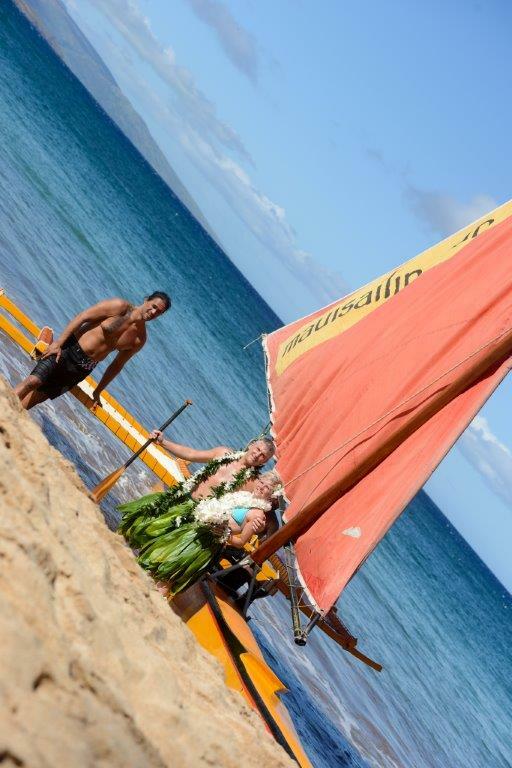 Franzi and Marcel decided to celebrate their Hawaiian Wedding on Maui in a more traditional way: They arrived via Outrigger Canoe which picked them up from the Fairmont Kea Lani and took them to Palauea Beach in Makena. 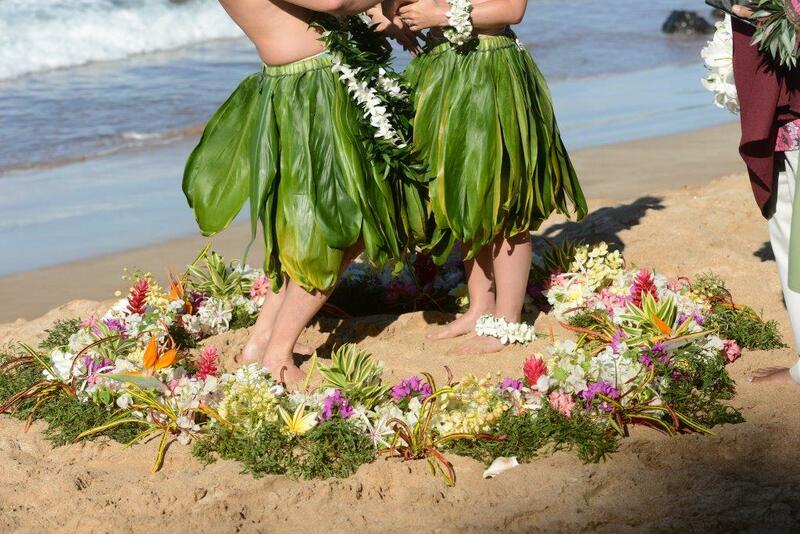 Since they also did not want to carry their wedding attire with them all the way from Switzerland, they opted instead for the very Hawaiian fresh dark green ti leaf skirts made that early morning by one of our Hawaiian dancers. We were all so thrilled that they veered away from the dress and suit and tried something different! The wedding was so much fun for everyone involved and we wish the both of them the very best on their journey together. 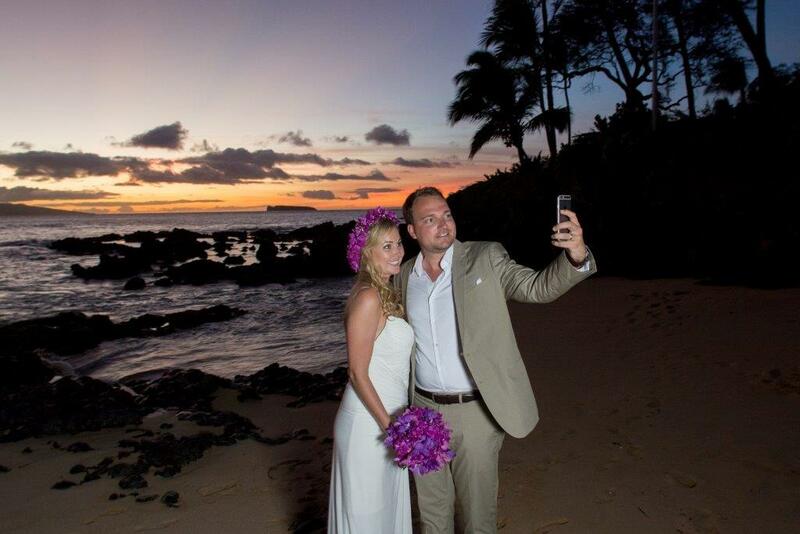 Beautiful Maui Beach Wedding – with a Selfie! 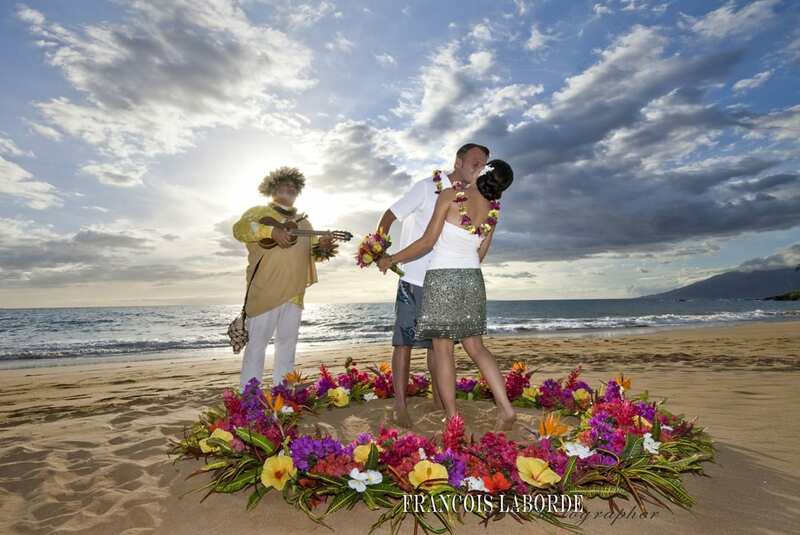 Monika and Frank were hoping for a romantic traditional Hawaiian ceremony with a hula dancer and a beautiful circle of flowers on a deserted beach with the perfect sunset at the end – and they got what they bargained for:-) Quiet beaches are many to be found on the remote south side of Maui where only one hotel and a handful of privately owned homes scatter the shoreline. We have no influence on the amount of visitors in bathing suits on any of the beaches but have found a few unknown gems for our couples to celebrate on. Sunset is such a romantic time of day with the light being so soft and perfect and the ocean breeze helping with the heat. 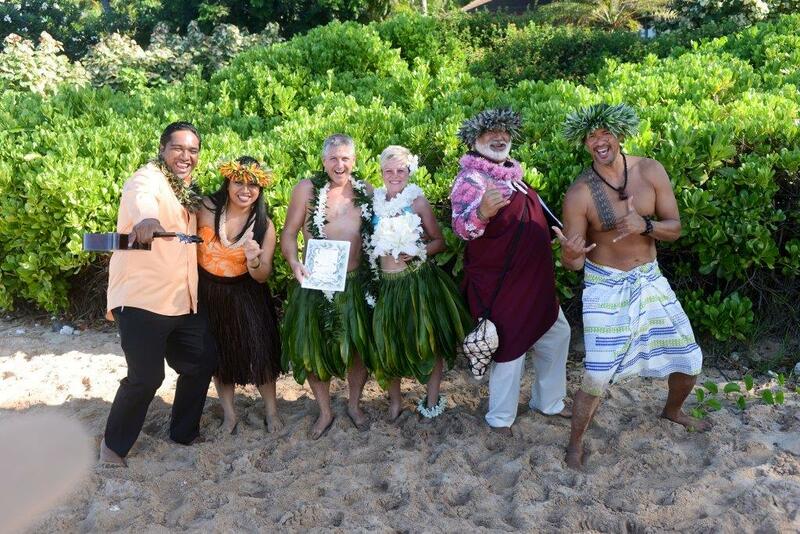 We will arrange for a Hawaiian style dinner in one of the many first class ocean front restaurants to follow. 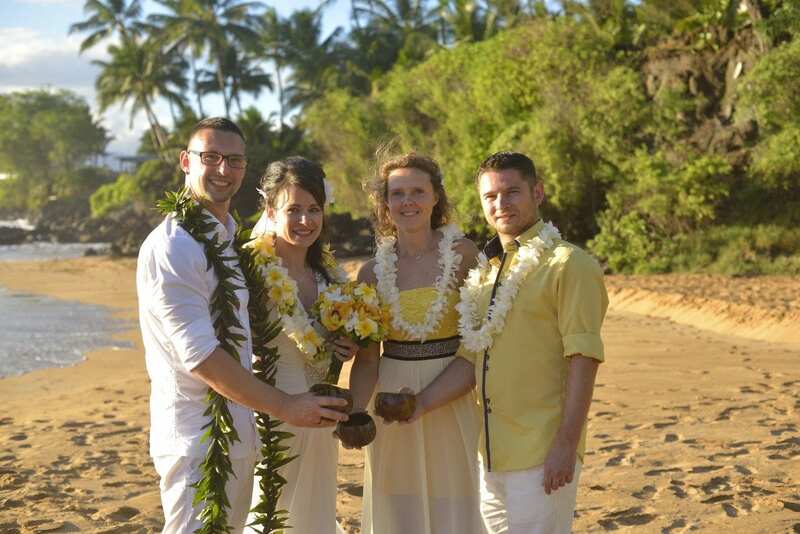 Relaxing on the beach after a beautiful Hawaiian ceremony.